Industry representatives and riders sound off on the new season. We’re less than 10 days out from the opening round of the 2014 Monster Energy MX Nationals, and the excitement levels and anticipation of the riders, industry and the fans is increasing as each day passes. But who will stand on the box when the series wraps up in 10 rounds time? We picked the brains of a bunch of riders and industry players to find out their predictions for the 2014 Australian Motocross Championship. Reasons – I think Coops is a great rider and we all know if he’s in the right headspace he’s world class. 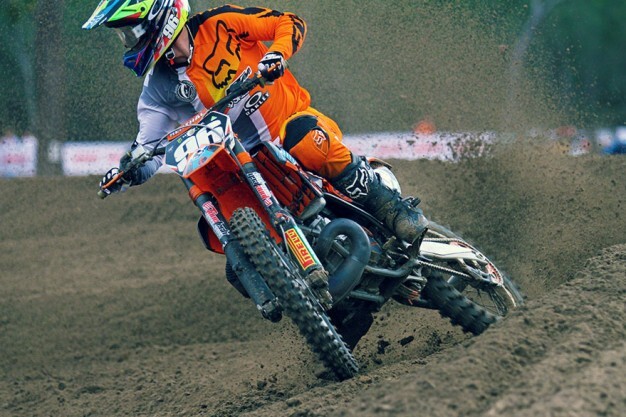 With Ben Townley behind him he’ll be hard to beat, as you can see in the NZ MX Nationals. For MX2 Clouty has good speed and he’s a young kid that wants it bad, which is nice to see. If he can keep injury-free he’ll be a frontrunner for sure. Reasons – Matt will be tough to beat, but Jake has a lot to prove on the Kawasaki. If he has fewer DNFs than last year he should be up there. I’m also expecting a lot from Mackenzie this year – his experience should make him unbeatable, but he has been inconsistent the past few years. For MX2 I think Cachia and Clout will fight it out for the title. Josh will definitely be fast, but injuries seem to plague him. He needs to be fit and injury-free all season to win. Reasons – Matt Moss is a machine and he isn’t last year’s champ for no reason. Cody Cooper has Ben Townley on his side and I think he’ll be on his game over here, Billy Mackenzie is fast when the track is destroyed in the last moto. In MX2 you can never count Cachia out and he’s just out to smoke everyone. Lamont has had some good results in NZ on the new Husky and I think he’s out to prove a point this year and Harrison has been training hard in the US. Reasons – It’s hard to bet against Mossy because he’s really in form at the moment and is carrying a lot of confidence after a big year in 2013. And in MX2 I’m backing Kale as he’s got a good set up, some good backing, and he’s doing it for himself. Reasons – Mossy’s in a league of his own at the moment. Coming off his success last season and his time in the States, I feel he’s the man to beat. When it comes to MX2 I’d love to put Josh Cachia in the mix but if the injury talk is true I don’t think he’ll make the distance of the season, although I hope he does. I think Clout showed great speed last year and was putting in great races against the EFI four-strokes and the big horsepower two-strokes. Now that he’s on an EFI Yamaha he’s going to be fast. Reasons – I think Jay’s move back to CDR has him really fired up. Having worked with him last time he was at CDR I know it’s the right place for him to be. Coops has been killing it in NZ and is coming in hot, and Little Monz, I think it’s his time to shine. MX2 Cachia is the man – he’s super-aggressive and as confident as they come. Makeham has done well at the VIC titles and I think that will help him a lot, and Longy proved everyone wrong last year. I think he’ll be a force in 2014. Reasons – Gibbsy finished last season strongly and I think he’ll do well this year, plus I have a lot of respect for the dude! Cooper has been really strong here and I think he’ll carry that pace into Australia better this year. Moss is coming off the high from 2013 and will definitely be hard to beat. Reasons – Mossy will win and he has a lot of confidence after racing supercross and two titles last year. I like his riding style and aggression. Coops is always fast at home but doesn’t seem to keep it together here for a whole season for some reason. Jay has had a lot of success with CDR and Dacka knows which buttons to push – I could easily see him finish second even. It’ll be a tough battle and I don’t know who’ll end up on top in MX2. If Josh is still possibly carrying an injury I think Luke will be a slightly stronger title contender. Reasons – I feel all three of these guys have had really good preparation for the upcoming season. Matt is definitely the favourite, but Kirk has shown good results in New Zealand. Jake Moss looks really comfortable and fast on the Kawasaki. Reasons – You’d be a brave man to bet against Mossy at the moment, especially as he’s riding high on confidence and pace. I don’t think he’ll have it all his own way, but as long as he remains injury-free he’ll be a mission to beat. For mine, the MX2 class this year is just as stacked – if not moreso – than MX1, but the likes of Brenden Harrison and Kayne Lamont have slipped under the radar of most. Clouty and Makeham will go toe-to-toe all season long, but Lamont could throw a serious spanner in the works if he carries his current NZ Nationals form into the series.